Bring the kids. Bring a blanket. Relax under the Ponderosa pines with an Independence Day concert sure to please. 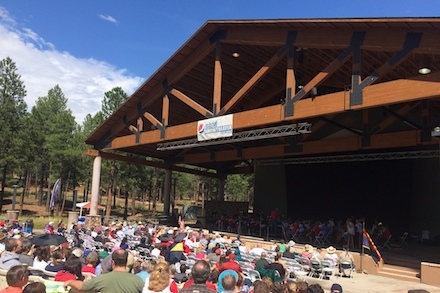 With generous sponsorship from the Coconino County, BlueCross BlueShield of Arizona, APS, North Country Healthcare, and Flagstaff Convention and Visitors Bureau the annual Independence Day Pops concert is held on Tuesday, July 4, 2018 and features the Flagstaff Symphony Orchestra conducted by Jon Eder in an afternoon of music for the whole community. Gates open at 2:00 p.m and music begins at 2:15 p.m. with guest performers. Flagstaff Symphony Orchestra concert begins at 3:00 p.m. This concert is FREE of charge with no tickets necessary. Please be aware the Amphitheater charges for parking in selected areas. For Pepsi Amphitheaters policies and regulations, visit their website: pepsiamp.com and select “About Us” and “Facts” in the upper right.